The International Lithuania Congress is a cyclical event combining academic panels, expert debates and cultural happenings. Its main aim is to bring together representatives of many disciplines (law, political science, international relations, European studies, sociology, linguistics, as well as, cultural and literary studies), who in their researches deal with Lithuanian issues in a broader geopolitical context. The organizers are: the University of Wrocław, the “Labas” Lithuanian Studies Club and the Pobliza Foundation. Previous editions (held in 2013, 2014, 2015) gathered nearly 100 speakers (students, doctoral students, PhDs and professors) representing twelve Polish and eleven foreign scientific centers. The fourth edition, which will take place from 22nd to 24th of May 2017, is devoted to the three symbolic topics constituting at the same time the general themes of this year’s Congress. Firstly, it is the Year of Culture of the Lithuanian Language, announced by the Lithuanian Seimas. 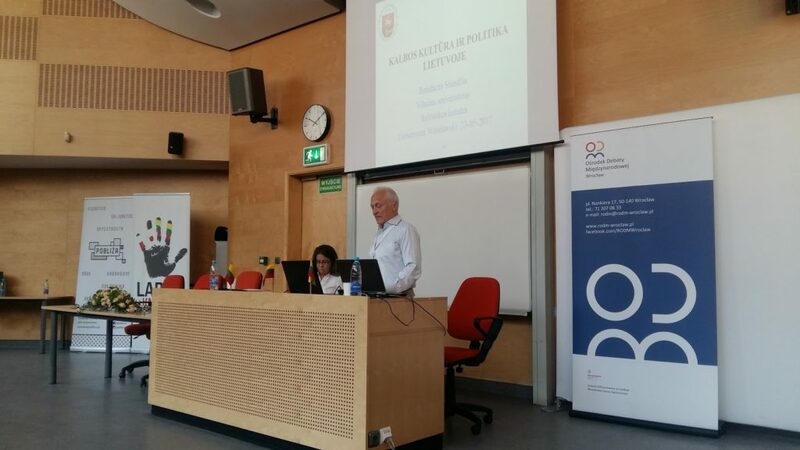 The uniqueness of the Lithuanian language and its special importance to the Lithuanian society will be stressed, inter alia, by the lecture by a Member of the Academia Europaea, prof. Bonifacas Stundžia, well-known Lithuanian linguist. Secondly, year 2017 is also the 25th anniversary of the adoption of the Constitution of the Republic of Lithuania, and 20th anniversary of the adoption of the Constitution of the Republic of Poland. The well-known constitutional experts will debate on the role of these documents, which are central to the legal orders of both countries. Participation in the experts’ debate is confirmed by prof. Toma Birmontienė (former member of the Lithuanian Constitutional Court); prof. Danutė Jočienė (current member of the Lithuanian Constitutional Court) and prof. Leon Kieres (current member of the Polish Constitutional Tribunal, former president of the Institute of National Remembrance). Thirdly, it is important to stress out the heritage of Algirdas J. Greimas – semiotician of Lithuanian descent, renowned literary scientist and linguist – on the 100th anniversary of his birth, and 25th anniversary of his passing. As a part of this section, the lecture of dr Mindaguas Kvietkauskas, Head of the Institute of Lithuanian Literature and Folklore in Vilnius, will be provided. The academic part of the IV International Lithuania Congress is accompanied by the cultural events, which are open to all interested persons. They will have opportunity to participate in jazz concert of Lithuanian musical duo- Dmitrij Golovanov and Veronica ChiChi (22nd of May in “Stary Klaszor” music pub), opening of Liudas Parulskis’ exhibition “Baroque and Concrete”, meeting with Edwin Bendyk devoted to the memory of prof. Leonidas Donskis, as well as, film show of the Giedrė Žickytė’s movie “How We Played the Revolution”, which presents Lithuanian transformation process (23rd of May in Zajezdnia History Center). The cultural events are co-organized with Rasa Rimickaitė, cultural Attaché of the Republic of Lithuania to the Republic of Poland. Thus far, this year’s edition is held under the honorary patronage of Rafał Dutkiewicz, Mayor of the city of Wrocław; Tomasz Kosoń – Honorary Consul of the Republic of Lithuania in Wrocław; prof. Adam Jezierski, Rector of University of Wrocław; prof. Algidras Gaižutis, Rector of the Lithuanian University of Educational Sciences; as well as prof. Jan Miodek, Polish linguist and former Head of the Institute of Polish Philology at the University of Wrocław. The media patronage is provided by: magazine New Eastern Europe; magazine Nowa Europa Wschodnia, web portal przegladbaltycki.pl; web portal zw.lt and web portal alkas.lt. The partners of the event are: Academia Europaea Wrocław Knowledge Hub; the Jan Nowak-Jezioranski College of Eastern Europe in Wrocław; the Konrad Adenauer Foundation; the Lithuanian University of Educational Sciences; the Mykolas Romeris University; the Regional Center for International Debate in Wrocław and Zajezdnia History Center. The draft of the program is available here.